Slowing facial hair growth can be done with in-office medical procedures, however natural remedies are also available, such as sugaring. This method not only removes unwanted hair, but also slows regrowth without the use of harmful chemicals or costly dermatologist visits. Always consult your physician before treating excess facial hair at home to rule out any underlying medical conditions that may require medical treatment. Mix 2 cups of sugar, 1/4 cup lemon or lime juice and 1/4 cup water into a medium saucepan. Bring all ingredients to a boil stirring often with a wooden spoon, instructs Beauty and Fitness Savvy's website. Cook the mixture on medium high heat to avoid scorching. Allow your mixture to simmer on low heat for 25 minutes or until it has turned an amber color. Make sure that you do not allow your mixture to boil over or burn at the bottom of the pan. Remove from heat and allow to cool for 15 minutes. You may also pour mixture into an air tight container and place in your refrigerator. 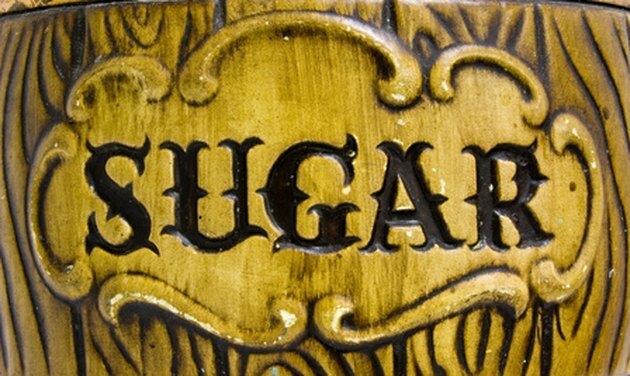 Apply your sugar mixture to your skin using a spatula once it has reached room temperature, suggests TheHairFacts.com. You may also use this mixture cold if you do not have all the materials present. Apply against the growth of your facial hair. Press a cotton strip firmly into the sugar solution that you have applied to your face. According to Beauty and Fitness Savvy, if you are using it cold, press the wax out on your hand to make a flat, paper and apply to your face, then peel up one edge to form a gripping spot. Pull the strip or cold sugar solution off of your skin in one quick motion, against the hair growth. Wipe the treated area with a warm, damp cloth to remove left over sugary residue and prevent stickiness. Repeat this process for every area of your face that unwanted hair is present.